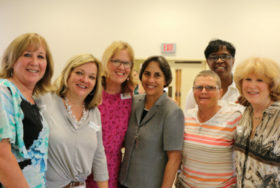 Holy Family hosts several annual fundraising events to support its life-changing programs and services. In addition to individual tickets, corporate sponsor opportunities are also available for each signature event. Even if you are unable to attend, items for the silent auction and prizes and always needed and appreciated. For more information about any of these events, please contact Carina Martin at 412.766.9020 ext. 1207 or Martin.Carina@hfi-pgh.org. Holy Family’s signature event in conjunction with the Pittsburgh Steelers and the support of Art and Greta Rooney. Holy Family’s Alumni Reunion Picnic is a celebration for Holy Family alumni and their families.